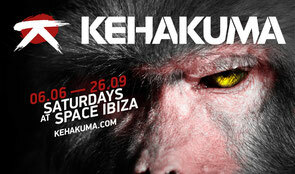 After its success last year, Kehakuma and elrow Ibiza are joining forces again every Saturday from 6 June until 26 September at Space Ibiza. Kehakuma will host the Terrace introducing changes for the brand new season, aiming for a more aggressive image with quality artists. In the room next door, elrow Ibiza will again turn the Main Room upside down every Saturday, presenting a new theme party to its nights: From Lost To The River. Kehakuma confirms four dates for its 2015 season with its two key figures Josh Wink and Steve Bug doing special b2b sets. The aesthetics of Kehakuma range from sensual geishas to the fragile evolution of a butterfly converted into origami, as minimalistic oriental elements and imagery are carefully selected. Staying connected and true to Japan, also known as the land of the rising sun, a touch of lava red runs like a common thread through the years of Kehakuma’s metamorphosis. This year's edition will feature the iconic Japanese Macaque monkey with its distinctive red face. Just like the Macaque’s temper being contentious at times, Kehakuma will hit the island with a renewed set of artists, playing house and techno, just as demonstrated by the heads of Poker Flat and Ovum Recordings. Originally from Philadelphia and going strong for over 25 years, Josh Wink has been one of the pioneers of the acid sound, followed by the success of productions such as ‘Don't Laugh’, ‘I’m Ready’ and ‘Higher State Of Consciousness’. His Kehakuma dance partner Steve Bug is one of the driving forces behind the “sound of Berlin”, and one of the headliners of the past Kehakuma Closing. He’s managed Poker Flat Records since 1998, and from this has evolved the labels Audimatique, Dessous and Traffic Signs.